Comfort food is comfortable, no doubt about it. If you've got a hankerin', then there's also my gourmet gourmet macaroni and cheese to keep you satisfied. On this page you'll find one of the best meat loafs ever. Four different meats give it a variety of flavors. We use lean meats and then add the fat via heavy cream. 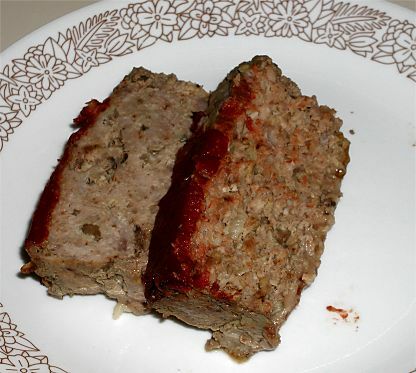 Using raw mushrooms and onions brings moisture to the meatloaf. The result is a perfect bite of loaf. Ray had already eaten dinner when he came over, and he still had two slices! It is important to chop the onions and mushrooms into small pieces so you're not chewing on hunks of them separately from the meats. The onions and mushrooms should be chopped to about the same size as the largest hunks of ground meat. A. lean ground steak 1 pound Have your butcher grind a steak that you select. New York is good. Boneless rib eye is exceptional. pork sausage meat 1 pound Not sweet or hot. Just spiced ground pork breakfast sausage. oatmeal 1.5 cups Rolled oats. Not "quick" or steel cut. garlic 1 clove Chopped. Don't use more than this. brown mushrooms 0.5 pound Chopped small. yellow onion medium, one half Chopped small. Use vegetable oil to lightly coat two loaf pans. In a large, and I mean LARGE mixing bowl, combine all ingredients. Use your hands to mix this all up really well. I mean mix it a lot. Get this stuff all combined. Split the meat mixture between the loaf pans and pack it in. Push it in so that there are no voids in the middle. Use a spoon to spread the tomato paste over the top of each loaf. Place on a center rack in the oven. Cook until the internal temperature is 150 degrees, about 45 minutes. Remove from the oven and let rest 10 minutes. The internal temperature should rise to about 160. Slice into one inch thick pieces and serve with ketchup. Serve with boiled red potatoes and Brussels sprouts. A nice red wine makes a delicious addition.